ITP UTV tires are proudly made in the USA! 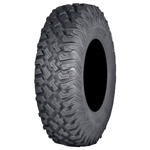 The ITP Bajacross is among the toughest tires on the market today, perfect for harsh terrain, rocks, thorns. The ITP Blackwater has a more aggressive design, better suited for muddier terrain.